Having had a hearty but low-residue breakfast in the crew quarters located some kilometres south of the VAB, the prime crew moved on to the suiting-up room where a covey of technicians helped them to don their spacesuits. These would protect them if they left the spacecraft for a planned venture outside, or if the cabin were to become unexpectedly depressurised. 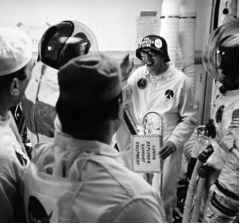 Careful checks were made to ensure that their suits were airtight (checking the pressure integrity in NASA parlance) before the crew were finally sealed in, with only a portable supply of oxygen which they carried with them to the launch pad. The large main display console in the CM that stretched from one side of the cabin to the other. 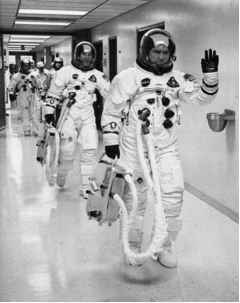 The crew of Apollo 8 carrying their portable oxygen supplies on their way to the launch pad. The white room at the '320-foot' level against maintained, never going below about the Apollo 14 CM a third of the atmospheric pressure at sea level. The pressure in the suits also dropped, and without preparation this could cause any nitrogen in a crewman's bloodstream to come out of solution and give him the 'bends' - a problem also faced by divers who rise too quickly through a column of water. To avoid this condition, any nitrogen was flushed out of the crew's bodies by having them breathe pure oxygen for a few hours before launch while sealed in their suits. Three hours before launch, the crew arrived at the 320-foot level of the launch umbilical tower and walked along the highest of the nine access arms, nearly 100 metres above the launch platform. 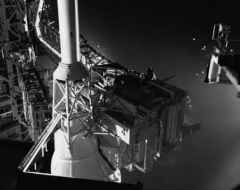 This arm led to the so-called 'white room', a controlled environment high above the Florida sands that gave access to the command module's hatch. One by one they entered the cramped confines of the CM cabin aided by the pad crew who strapped them tightly into their couches and changed their oxygen supplies from the portable kit to the spacecraft's circuit. The commander, who entered first, settled into the left couch from where he could scan the instruments and watch for any problems arising in their trajectory. If trouble arose that threatened the crew, he was ready to twist the translation control with his left hand and abort the mission. From Apollo 11 onwards, he also had the option of flying the Saturn rocket to orbit manually, instead of using the Saturn's guidance system. Tom Stafford and Eugene Cernan wait to enter the Apollo 10 spacecraft. (CMP) entered last to occupy the centre couch. During ascent, his major role was to assist the commander in watching the progress of their climb and to operate the computer. There was only one exception to this arrangement when Mike Collins, CMP on Apollo 11, took the right seat and entered before Aldrin, who was LMP. Collins felt that the start of the elevator ride at the bottom of the launch umbilical tower was really the start of his journey to the Moon. Walking across the ninth arm, he was impressed at the contrasts in his field of view. "On my left is an unimpeded view of the beach below, unmarred by human totems; on my right, the most colossal pile of machinery ever assembled.'' 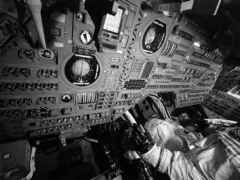 By the time Collins was named with Neil Armstrong and Buzz Aldrin as the prime crew of Apollo 11, his crewmates had already served as backup crew on Apollo 8 and had practised launch procedures with Buzz in the centre couch. It was decided not to change this and Collins should train for the right seat for the launch. Collins continued a Space Age tradition by giving the leader of the pad team, Guenter Wendt, a going-away gift; in this case, a tiny trout nailed to a plaque in recognition of Wendt's tall fishing tales. There were often little gifts or pranks that helped to lift the tension in the white room in the edgy moments before a crew were shut away in the spacecraft. Armstrong gave Wendt a ticket for a 'space taxi ride' and Aldrin presented him with a Bible, the German returning the favour with a mock 'Key to the Moon', which he presented to Armstrong. 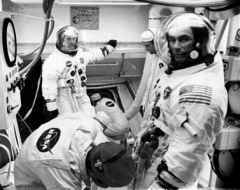 Another example was when the Apollo 14 crew were boarding the CM. Alan She-pard, then the oldest of the astronauts and already a grandfather, presented Wendt with a German Army helmet, gaining a mock walking stick dubbed the 'lunar explorer support equipment' in return. Guenter Wendt presents Alan Shepard with a walking stick before Apollo 14.
initialised; the spacecraft would not direct the rocket but it had to know where it was and it needed to keep track of where the Saturn V was taking it in case the commander had to assume control. 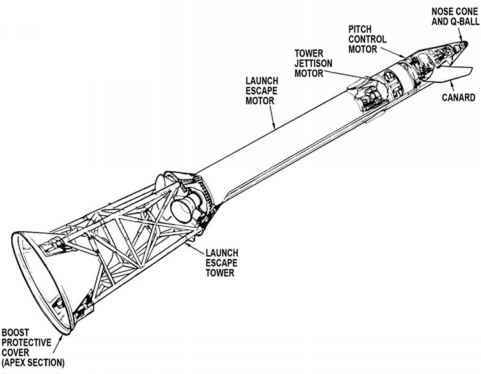 Then with four minutes of the countdown remaining, the ninth arm carrying the white room was swung away from its interim position to be fully retracted on the opposite side of the launch tower, as far away as possible from the plume of flame that the rocket would leave in its wake as it lifted off.